Oil-Electric: Union Pacific's "Phase Two"
Union Pacific Railroad 1432, Argo Yard, Seattle, April 10, 1963. Although I didn’t know it at the time I shot this photograph, I am a mere six months away from enlisting in the USAF. Another story, another time! This particular summer, I was employed as a surveyor with the US Coast & Geodetic Survey – now the National Oceanographic & Atmospheric Administration. I was part of a marine survey crew updating a nautical chart covering the area between Mukilteo, Clinton and Hat Island in the Puget Sound. That's another story, another time! 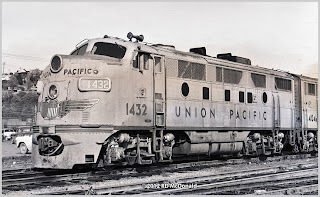 What we have here - and Union Pacific had an impressive fleet of them - is the utilitarian F3. Stock livery with an annoying single “blat” air horn. They sounded bad enough under normal operating conditions. But if the horn got choked with rain or snow, you'd begin to look for a Holland & Holland to put them out of their misery! The four rectangular and two porthole openings, along with the chain link fencing, are the hallmarks of the early so-called “Phase II” F3’s. General Motors never referred to “phases” in their catalogs or other official literature. It was locomotive enthusiasts who created the “phases” to mark the progression of models as cosmetic changes were made. These were my favorite – the chain link fence version! As I recall, Argo Yard was built by and maintained by the Northern Pacific Railroad. 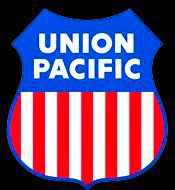 Union Pacific wisely signed a document known as “track rights” which gave the Union Pacific direct access to Seattle and the Puget Sound, over Northern Pacific steel, without having to lay basically a parallel rail line up to Seattle from Portland. While the Northern Pacific had a small engine house, yard office and servicing facilities in the northwest corner of this facility, Union Pacific had offices and a servicing facility in the southeastern corner. Railroad Stuff: Union Pacific Railroad 1432, built by Electro Motive Division as an F-3, 1,500 hp, released March 1, 1948, serial number 4637. Retired to Electro Motive Division in February 1964.